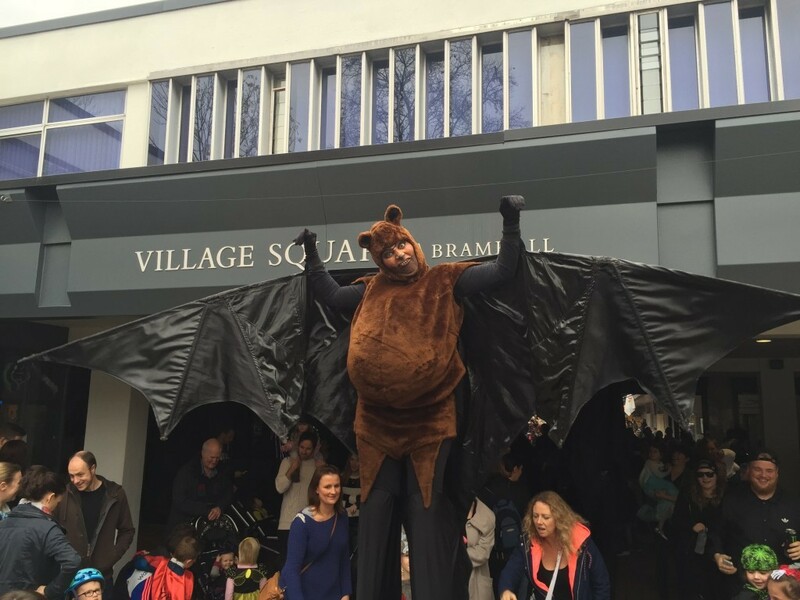 On Saturday, October 31st the Spooktacular Halloween event took place at Bramhall Village Square. The event was organised by Imagine FM and it was free for all to attend. The crowds came dressed in their spooky and fancy outfits to celebrate Halloween. There were grownups, children, young ones and even dogs joined in with the fun. The children’s outfits signified different characters of their choice. Some were scary characters such as witches, skeletons, zombies, pirates and grim reapers. Some chose to emulate movie characters such as Shrek and Cat Woman. A few little girls wore princess costumes, and boys were dressed as police officers, superheroes and football players. There was even dressed up pets in Halloween costumes. The numerous activities available made the fun-filled family event fun and enjoyable. Families were able to participate in a variety of spooky themed activities such as watching and interacting with the stilt walking bats, scary face painters, and a children’s spooky craft workshop and Halloween disco. The children were eager to get their faces painted, so there were queues at the free face painting area at the event. Kids also made use of the play area where they can safely have fun in the Village Square. The some of local shops in the Village Square decorated their shops and some also had special offers. For instance, Modiste were giving 10% off all purchases, The Country Fayre were offering pumpkin soup at £1.75 amongst other savoury treats, the pocket-friendly prices gave the crowds an opportunity to savor the delicacies. The Crookilley Crafts Emporium had bunting and trick & treat bags, and there were plenty of Halloween items available for sale at discounted prices at the Poundstop and of course for those treats there is always A Sweet Thought. The highlight of the event was the Halloween Parade that even stopped traffic down Bramhall Lane South! The spooky parade around the square was led by the stilt walking bats while children and adults followed them around the village square. During the parade, some adventurous children got to walk between the stilt walking bats that lifted them high up by their hands to boost their height.